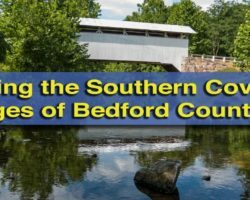 The fourteen historic covered bridges in Bedford County are among some of the most beautiful and best preserved in the state. 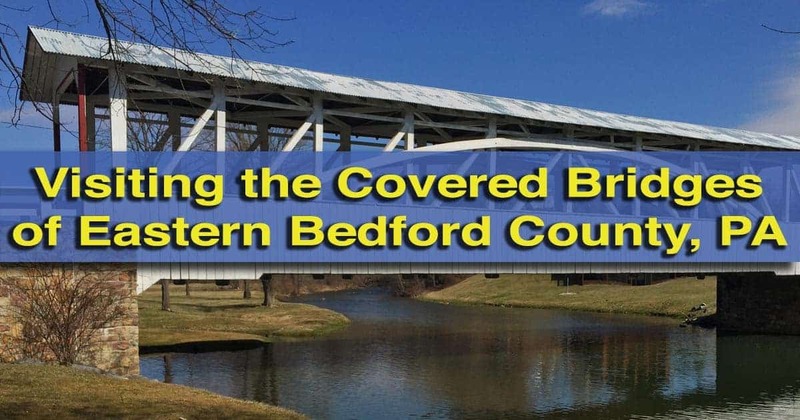 I’ve already covered the covered bridges in southern Bedford County, and today, I’m going to talk about the three bridges in the eastern portion of the county. 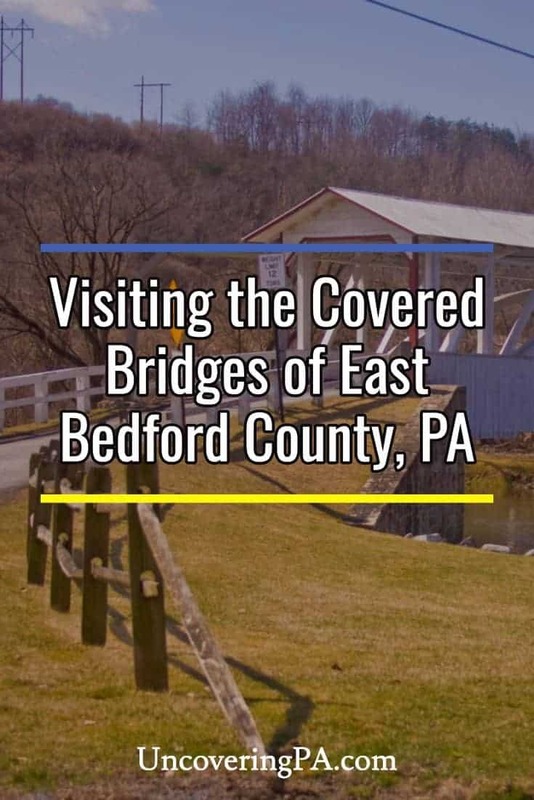 These bridges are located fairly close to Breezewood, a busy travel area where the Pennsylvania Turnpike and Interstate 70 meet (or split, depending on which way you are traveling). 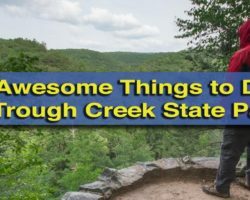 The first two listed are set just southwest of Breezewood, while the third is approximately 20 minutes north. 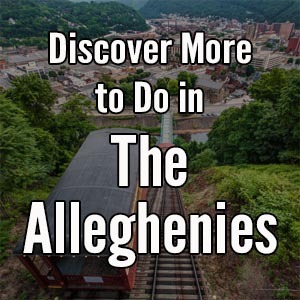 These bridges are well-worth visiting either before or after a visit to the Abandoned Pennsylvania Turnpike. They are listed below from east to west, which is also south to north. Jacksons Mill Covered Bridge is one of Pennsylvania’s most unique covered bridges. Jacksons Mill Covered Bridge is located just a few miles southwest of Breezewood, Pennsylvania. 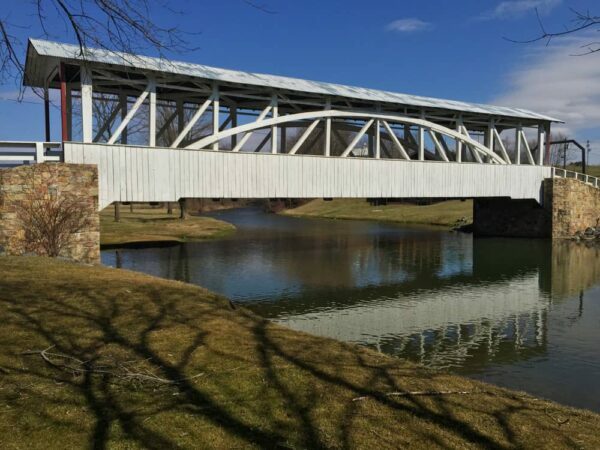 One of two similarly named historic covered bridges in Pennsylvania (the other is in Washington County), this bridge is one of the most unique in Pennsylvania. That’s because a portion of the span across Brush Creek is not covered. 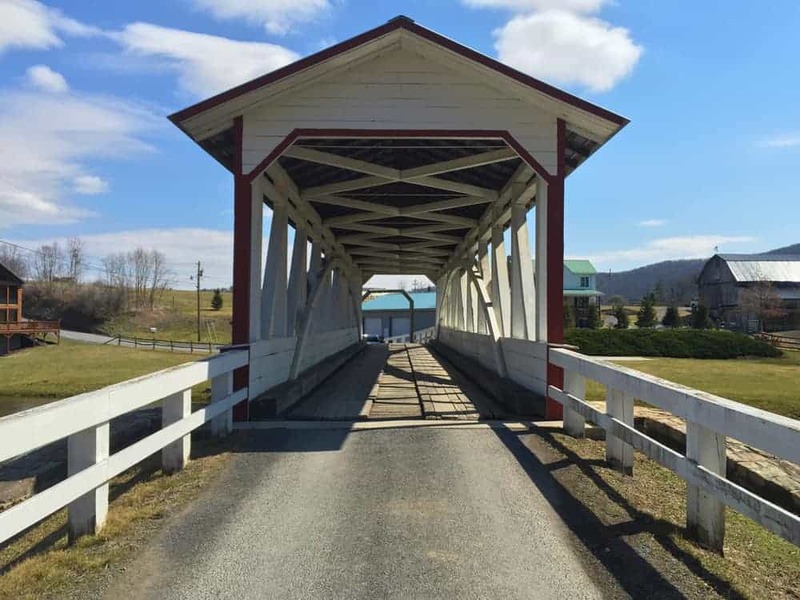 This uncovered span of the bridge gives Jacksons Mill Covered Bridge a unique look that’s worth seeing even if you’ve visited dozens of other Pennsylvania Covered Bridges. Jacksons Mill Covered Bridge was built in 1889 and is 91 feet in length. It was refurbished just a few years ago and is one of the best looking bridges in the region. A wider look at Jacksons Mill and its covered bridge. Nearby, Jackson Mill still sits next to the bridge. While it is privately owned, it’s great to see this historic structure in decent condition. Getting There: Jacksons Mill Covered Bridge is located in a picturesque valley just three miles southwest of the main drag in Breezewood. It can be found at the following coordinates: 39.971226, -78.271761. 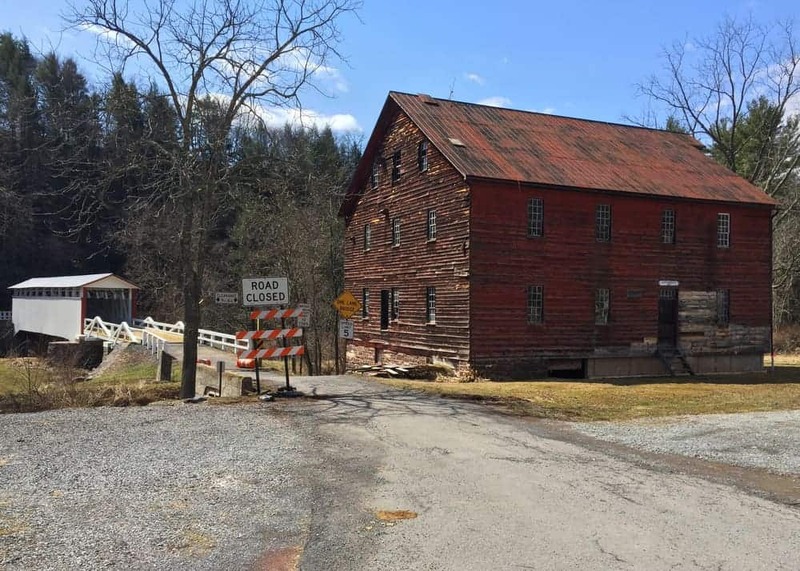 Parking here is a bit tricky due to private property, but there is room to pull off to the side of the road near the bridge at the intersection of Jackson Mill Road and Covered Bridge Road. 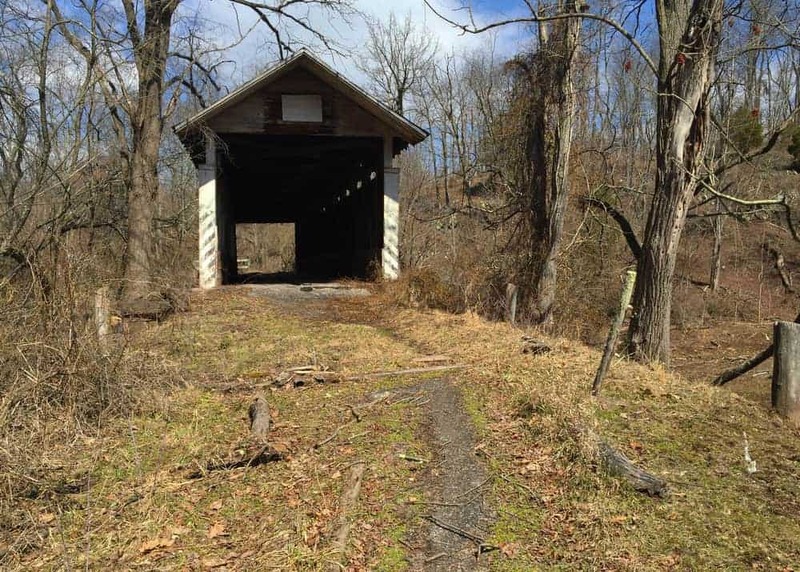 Feltons Mill Covered Bridge is in major need of repair. In contrast to the great condition of Jacksons Mill Covered Bridges, Feltons Mill Covered Bridge is in very poor condition. This privately owned structure sits only about a mile from Jacksons Mill but is quickly being lost to time and nature. Given that it’s located next to the original Feltons Mill, it would be great to see these structures rehabilitated. Feltons Mill Covered Bridge was built in 1882 and is 105 feet long. It crosses Brush Creek downstream of Jacksons Mill Covered Bridge. When I visited this bridge in the past, it appeared to be accessible to the public. However, since it is on private property, always look for no trespassing signs and make sure to respect the rights of the property owner. 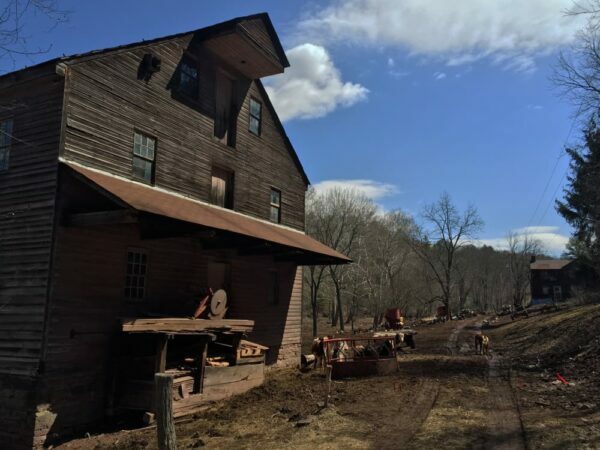 Feltons Mill sits on private property. If you can’t access the property, it is still possible to get at least a glimpse of this bridge from the concrete bridge on East Mattie Road. Getting There: Feltons Mill Covered Bridge is located 1.5 miles west of Jacksons Mill Covered Bridge and four miles from Breezewood. It can be found at the following coordinates: 39.973001, -78.289501. There is a bit of room to pull off of the road along the southern banks of Brush Creek. Keep in mind that this bridge is on private property. While it maybe possible to still walk up and take a closer look at the bridge, it might also be best to observe it from the public roadway. Halls Mill Covered Bridge is one of the most beautiful covered bridges in Pennsylvania. I’ve visited well over 150 historic covered bridges in Pennsylvania, and Halls Mill Covered Bridge is easily one of my favorites. Located about 20 minutes north of Breezewood, this bridge is set in a beautiful valley and is in pristine condition. Halls Mill Covered Bridge crosses Yellow Creek and is 91 feet in length. It was built in 1872. Like many of the other covered bridges in Bedford County, Halls Mill Covered Bridge is painted white with red trim. Its sides are open, offering great views into the creek below while standing on the bridge itself. Another look at Halls Mill Covered Bridge. 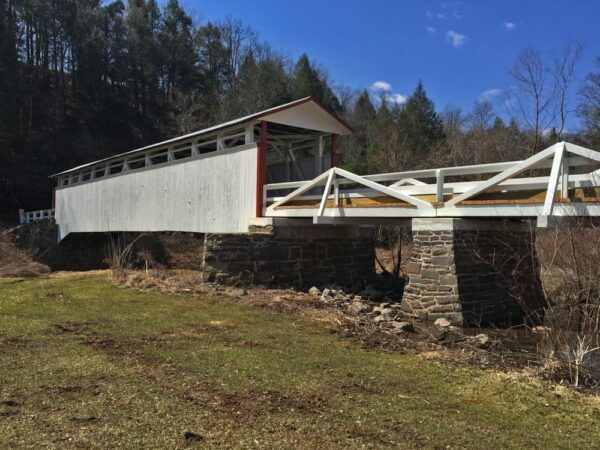 While a 20-minute diversion might sound like a lot to see one covered bridge, this one is definitely worth the excursion. Getting There: Halls Mill Covered Bridge is located in northern Bedford County about 20 minutes north of Breezewood. It can be found at the following coordinates: 40.124261, -78.317176. Parking here is quite easy as there is plenty of room to pull off on St. Paul’s Church Road. Did you know that all of Bedford countys covered bridges originally had siding the whole way to the top? That was fine in the horse & wagon days, but as traffic volume & speeds increased, there started to be crashes at the bridges due to drivers not seeing vehicles that were on the bridges. 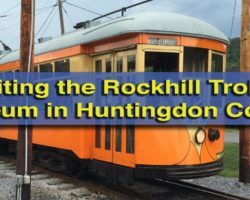 The solution, as the county saw it was to remove the siding to increase visibility. They left the bottom on because that was the height of the interior “crash boards” that protected the structure. Some bridges like Feltons Mill, the road curved the same direction at both ends, so only one side needed opened. Others like Youndt Station they just cut holes in the siding rather that opening the entire side. As ugly & cheapskate as the “solution” was at the time, it is what made Bedfords bridges so picturesque & quaint looking today.